Jackson! Need I say more? Of all the pictures I've seen of people's vision of Jackson, this one comes the closest to jumping right out of my head and onto the computer screen. THIS is my Jackson! 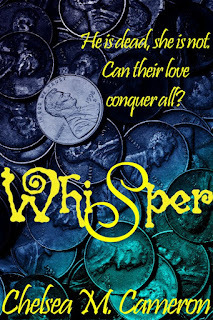 Whisper will be released on June 16th in Ebook and later in June in paperback. Here's a sneak peek of the first chapter! You don't look like the kind of girl who would speak to the dead. “I can't decide if that's meant to be offensive or not.” He was right, though. From my t-shirt which had a picture of the Cookie Monster on it and a caption that read, “Come to the Dark Side, we have cookies,” my holey yoga pants that had never been used for yoga, and my mismatched Christmas socks, to my not-straight-but-not-curly hair blondish hair, I didn't look like the kind of girl who would talk to dead people. I didn't hang out in cemeteries and listen to too much Evanescence and wear a lot of crystals. Not that there was anything wrong with any of those things. It was not meant to be offensive. “What was it meant to be?” I pulled my knees up and put my chin on them. Didn't your mother call you for dinner? Evasive. There was definitely something different about him. Most spirits were so confused about where they were or if they were dead they didn't know how to be evasive. This guy was something else. No. Just visiting. Spirits didn't visit. The only reason they hung around was to accomplish something they'd left undone. So either he didn't want to tell me, or he was just messing with me. Do whatever you want. He was starting to get on my nerves. I walked to the doorway. Once I was through there, I was going to pretend I was normal. “Thank you.” I took a step. 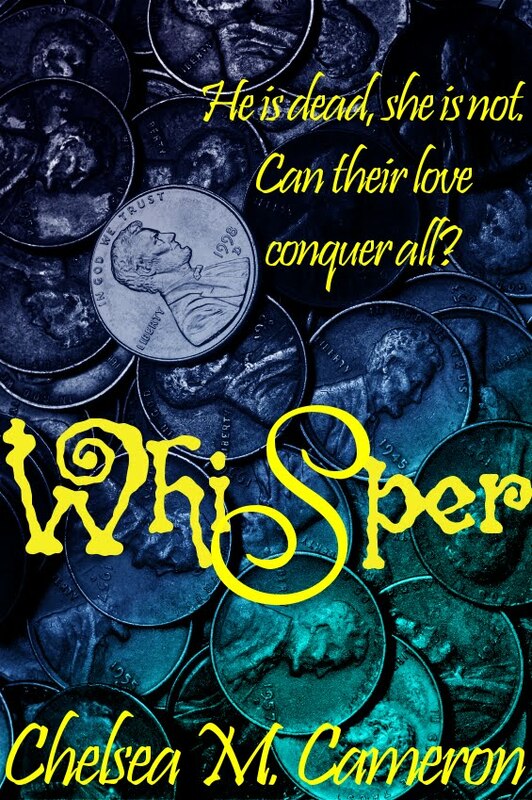 Don't forget to add Whisper to your Goodreads shelf. Chelsea M. Cameron is a YA writer from Maine and author of Nocturnal and Nightmare, the first two books in The Noctalis Chronicles and Whisper, about a boy who is dead, a girl who is not. Lover of things random and ridiculous, Jane Austen/Charlotte and Emily Bronte Fangirl, red velvet cake enthusiast, obsessive tea drinker, vegetarian, former cheerleader and world's worst video gamer. When not writing, she enjoys watching infomercials, vacuuming and tweeting. She has a degree in journalism from the University of Maine, Orono that she promptly abandoned to write about the people in her own head. Follow her Blog, on Twitter or Facebook and find her books on Amazon and Barnes and Noble. Do you believe in spirits? Comment below by May 28th for your change to win an ecopy of Whisper sent to you the day before it's released! Be sure to visit Chelsea's Blog for a chance to win a $10 Amazon gift card. It's almost time, y'all! May 29th will be here before you know it. In the meantime, I thought you might like to check out the playlist. Since I'm extraordinarily technically challenged, if it doesn't show up in this post, it will definitely appear on the sidebar, over there---------> Yes, for those who are also blogger challenged, I felt the need to point in the direction of the "sidebar" just in case the name wasn't self-explanatory enough. DOY, Michelle. LOL Laugh it up, folks! I'm here for your entertainment. Which book? It's your choice. You can choose any of my ebooks on either Amazon or Barnes & Noble. When is the giveaway? Whenever I tweet "Random Acts of Kindness Giveaway." I might do one a month, one a week or three a week. Who knows? And finally how do I enter? That part is easy. All you do is tweet me @mleightonbooks "I'd love to read ________" and you fill in the blank with the title of one of my books that you'd like to read. That's it. Easy peasy. At the end of the day, I'll draw from those who tweeted me and the winner will get the ebook of their choice. Have I mentioned that I adore y'all? Each and every one of you? No? What a shame!! Because I really, REALLY do! Hump day, hump day, hump day! Squeeeee! Have a good one, y'all!! It's due out this month. I was hoping for earlier, but life has been giving me fits without many giggles, so it will likely be the latter part of the month:( BOO! But, better late than never, right? Right! I looked over at Jackson where he swam strongly at my side. We both knew he could easily leave me behind to reach his destination more quickly, but he didn’t. Despite the seriousness of our task, he held back to stay with me, to stay by my side. It’s where he’d promised he would always be. Go check out what the others are working on, y'all! And, as always, TGIF! !